Karnataka election results give PM Modi and his party far more confidence as India prepares for national elections next year. Kanataka Election Results: In less than three hours of counting, BJP had crossed the half-way mark. 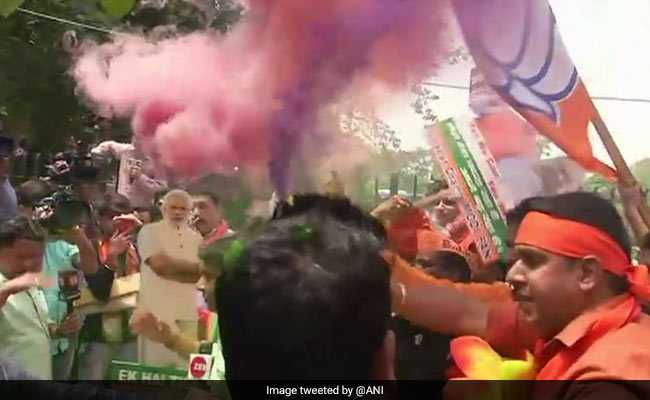 New Delhi: The flowers, buntings and the caterers streamed into the BJP headquarters in Delhi today as the party looked set to win easily in Karnataka, one of the last big states ruled by the Congress. Makings of a big feast were visible as stacks of plates were carried into a hall at the BJP's brand new building in central Delhi. Several top leaders, spokespersons and union ministers came in. BJP president Amit Shah would arrive by 1 pm, reporters were told. Cutouts of Prime Minister Narendra Modi and Amit Shah were held up at the BJP office in Bengaluru by slogan-shouting workers. In less than three hours of counting, the BJP had crossed the half-way mark and was on its way to winning a majority on its own - without any support. "There is no question of alliance with the Janata Dal Secular as we are already crossing 112 seats," said BJP leader Sadananda Gowda. Shobha Karandlaje, a close aide of the BJP's presumptive chief minister BS Yeddyurappa, said: "We have achieved our dream of Congress-mukt Karnataka and Amit Shah, Modi, Yeddyurappa here." The BJP has not just won back its gateway to the south, but the election result also shows that the party has popular support outside its traditional support base of north and west India. It gives PM Modi and his party far more confidence as India prepares for national elections next year. The party had been seen to tackle a rough patch in the aftermath of recent by-election losses in Rajasthan and Uttar Pradesh; the opposition seized on the defeats, saying the ruling party was facing public anger because of rural distress and poor job creation,"
Barbs flew freely from the BJP camp. "This is a historic win for BJP. I want to thank all the people of Karnataka for voting for us. Ab desh mein Congress khojo abhiyan chalega, kahaan rahegi pata nahi (There will now be a Congress khojo (look for Congress) drive," said Raman Singh, Chhattisgarh Chief Minister.